Domaine Rion’s father and daughter team, Alice and Bernard, practice la lutte raisonnée, or environmentally responsible management methods on their vines, and prefer ploughs over weed-killer. And this small family-run vineyard's 8-hectares of soil repays them in full, because the Rion family pamper their land for its exceptional Pinot Noir, and another gem with a more unusual name: Tuber Uncinatum, also known as the Bourgogne truffle. When autumn comes you can unleash the estate’s dogs (Italian Lagotto Romagnolos), send them into the truffle fields and unearth these precious fungi with the owners. They call this the cavage, or truffle hunt, and it’s the only method authorised by the Bourgogne Truffle Charter, with the dog’s scent guaranteeing the truffle’s quality. Just imagine the tasting that will follow, with the truffle paired with a Clos de Vougeot. That should do the trick, don’t you think? L’Auberge du Vieux Pressoir: In Chenôve, just 6 km from the centre of Dijon, this bistro-style restaurant is run by the Simon family. The décor is contemporary with bare stone walls, and the produce fresh, local and traditional: poached egg in a red wine sauce, seared foie gras, sweetbreads and fennel fondue with bream. A relaxed and inviting environment! Le Saint Nicolas: In Morey Saint Denis, in the heart of the old village, with four guest rooms (including two family rooms) in a renovated winemaker’s home. The welcome is warm and the environment outstanding, situated opposite the prestigious Clos des Lambrays on the Route des Grands Crus. 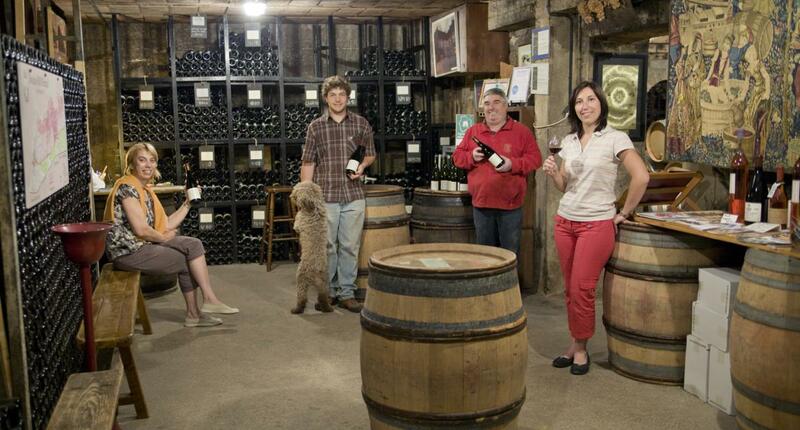 Taste and buy your wine in the property’s own cellar.